The right study guides can ensure you pass the certification exams that can launch your career or take it to the next level. And we've got those study guides right here for your CompTIA certifications. Get the Ultimate CompTIA+ Certification for $59.99 at Escapist Deals. Get study guide for eight certifications: CompTIA A+, CompTIA Security+, CompTIA Network+, CompTIA Cloud+, CompTIA Project+, CompTIA Linux+, CompTIA Certified Healthcare IT Technician, and CompTIA Advanced Security Practitioner (CASP). Use the materials to take the next step toward a career as a project manager, network admin, Linux system admin, healthcare IT technician, and more. You'll have a year of access to the course material, so you'll have plenty of time to brush up. 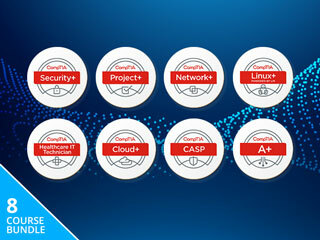 Get the Ultimate CompTIA+ Certification for $59.99 at Escapist Deals.